I'm not sure I'd perform well with decoration above the bathtub (I'd be a little too careful with not getting anything wet) but I have to admit these ideas look pretty cool, huh? So what is it for you then? Clean cut and practical or daring decoration above the tub? I'd like to hear your experiences! P.s. I have this bathroom dilemma as well. 6 comments on "Bathroom dilemma"
With 2 kids and living on an island with earthquakes, my answer will be no....but the photos are amazing!!!! You're right about the earthquakes- I hadn't thought about that! As for kids I can only imagine.. 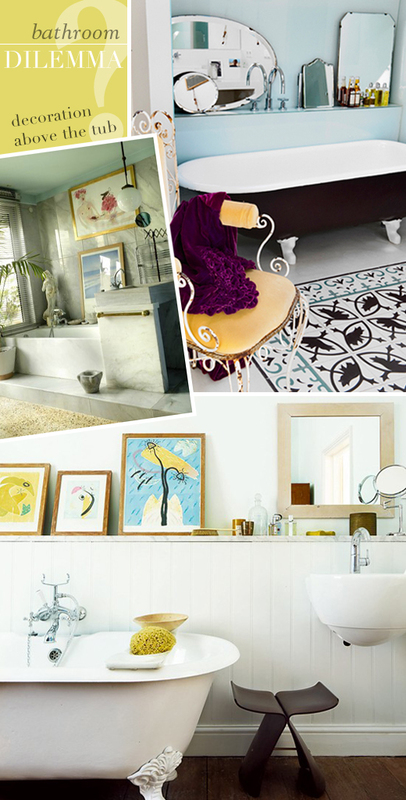 I love the second one, with the pictures on the shelf higher above the tub (maybe because I love that artwork too!). 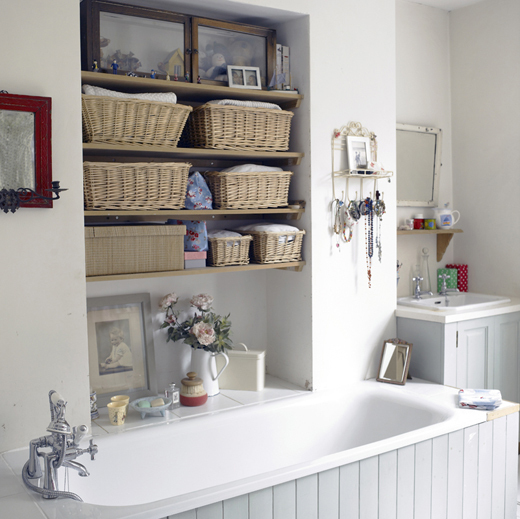 I could hang things above the tub like the last photo, but not lean them right on the tub deck! Fun ideas! I've got a beautiful painting hanging above my tub. Was a bit worried it that it was going to be damped and destroyed but it looks as fresh as it did when I hanged it there, a year a go. I Love it!